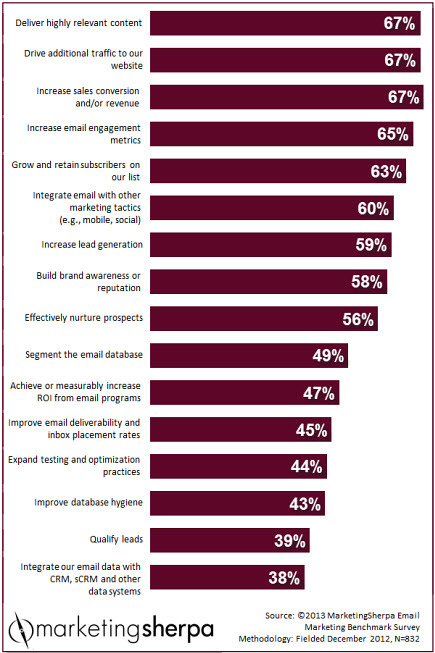 Marketing Research Chart: What are your peers' top email marketing goals? Well, let's take a look at how your peers answered that question. In this MarketingSherpa Chart of the Week, we explore organizational email marketing goals. Keep reading. As we search for brand-side marketers to speak at MarketingSherpa Email Summit 2014 in Las Vegas, one of the top questions on our mind is — what are marketers trying to achieve with their email marketing? Q: Which goals does your organization want to achieve through email marketing in the next 12 months? Please select all that apply. Not surprisingly, "increase sales conversion and/or revenue" was a top choice, chosen by two-thirds of marketers. How does one increase sales? "Drive additional traffic to our website," also chosen by marketers as an organizational goal for email marketing in the next 12 months. How do you get more traffic from your email marketing? "Deliver highly relevant content," which, likewise, 67% of marketers are trying to do. As you can see, the top three objectives from email marketers, all chosen by 67% of those surveyed, are tightly aligned. If we step back and look at the chart as a whole, we see more than half of marketers chose nine of the 16 options as an organizational goal. This is a significant challenge to email marketing effectiveness. If we prioritize everything, we prioritize nothing. My biggest takeaway from this chart is this — if you are seriously looking to optimize your email marketing program over the next 12 months, choose just three or four goals. As the above example indicates, those three or four goals may be tightly interrelated. We want to increase sales. How will we do that? Drive more traffic to our site. How will we do that? Deliver content that is more relevant. I'm not suggesting you totally ignore any aspect of email marketing, but I do believe you must choose not to do some things in order to do other things better. And, once you've optimized, say, your nurturing program to a certain level, feel free to drop that goal in favor of, say, database hygiene. Just don't do it all at once. Email marketing, like life, is about choices. Hopefully this chart, which shows the email marketing goals of your peers, can help you make those choices. Email Marketing: What are the top three steps for effective email marketing?